For adults age 65 or older, the income limit for no-cost Medi-Cal is only 122% of the poverty line. Once they turn 65, many Californians with low incomes cannot access free Medi-Cal because the countable income limit for seniors, which is set by the state, is much lower than it is for younger adults. For seniors living on their own, the limit is equal to 100% of the poverty line — currently $1,041 per month for an individual — plus $230, which results in a monthly threshold of $1,271 in 2019 (122% of the poverty line). This is $166 less than the limit that applies to adults age 64 or younger. In short, seniors with incomes above 122% of the poverty line but below 138% of that threshold fall into an eligibility gap that prevents them from enrolling in no-cost Medi-Cal. These seniors may still access Medi-Cal services, but only if they pay a deductible, known as a “share of cost,” that can amount to hundreds of dollars per month. In effect, Medi-Cal’s unreasonably stringent income rules impose a financial penalty on seniors. One way to illustrate this “senior penalty” is to look at how Medi-Cal’s rules affect two people — one age 64, the other age 65 — who have the same countable income ($1,350 per month). 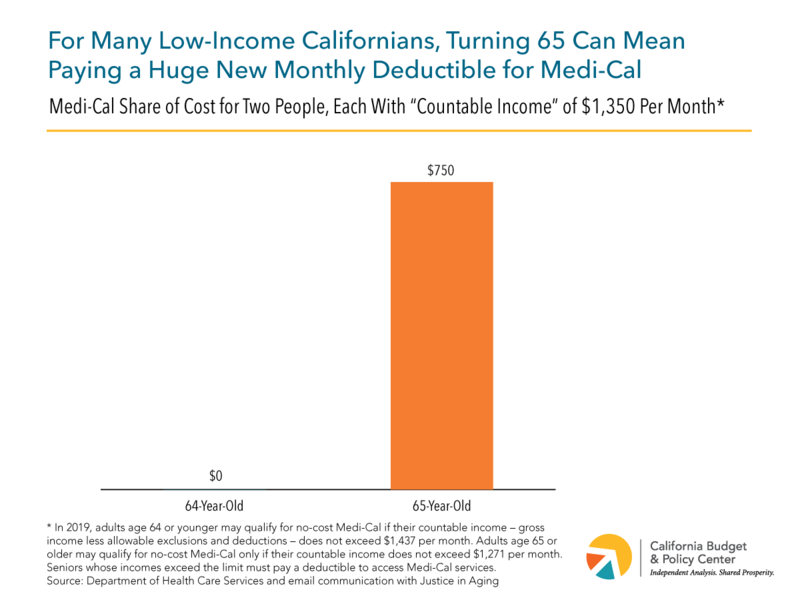 As shown in the chart below, the 64-year-old would qualify for no-cost Medi-Cal because her income would fall below the threshold that applies to adults through age 64 ($1,437 per month). In contrast, the 65-year-old would not qualify for free Medi-Cal because her income would exceed the much-lower threshold that applies to seniors ($1,271 per month). This senior would have to spend $750 on health care in any given month — her share of cost — before Medi-Cal would begin paying for any remaining medically necessary services during that same month, leaving only $600 to pay for rent, utilities, food, and all other basic living expenses. By raising the Medi-Cal income limit for seniors to 138% of the poverty line, state policymakers would 1) create parity between older and younger adults and 2) remove the primary obstacle that prevents many low-income adults age 65 or older from accessing no-cost health care services through Medi-Cal — services that are critical to seniors’ health and well-being. Undocumented immigrant adults generally are not eligible for comprehensive no-cost Medi-Cal coverage. The federal government annually adjusts the poverty line for inflation. As a result, the dollar amount of the income limit for no-cost Medi-Cal that applies to nonelderly adults rises each year to reflect changes in the cost of living. This eligibility gap between seniors and younger adults exists for two reasons. First, seniors were not included in the federal Affordable Care Act’s expansion of Medicaid eligibility to 138% of the poverty line. As a result, decisions affecting seniors’ eligibility for Medi-Cal are largely left to the states. Second, California policymakers have consistently failed to update a key component of the formula that determines seniors’ eligibility for no-cost Medi-Cal (see endnote 4). The dollar amount of the income limit that applies to seniors generally goes up modestly each year because it is partially based on the federal poverty line, which typically rises from year to year. However, this income limit has never been fully adjusted for inflation because the $230 that is built into the state’s formula has remained frozen since this formula was established in 2000. As a result, the income limit for no-cost Medi-Cal continuously loses ground to the rising cost of living. In 2000, for example, adults age 65 and older could qualify for no-cost Medi-Cal as long as their income did not exceed a threshold that was equal to about 133% of the poverty line. However, because this threshold’s value has steadily eroded, it is equivalent to only 122% of the poverty line today and will continue to lose value relative to the cost of living unless state law is changed. In this example, the $750 share of cost results from subtracting what is sometimes called a “Maintenance Need Allowance” (MNA) — as determined by the state — from the 65-year-old’s countable monthly income. The MNA for an individual is $600, a figure that has not been adjusted since 1989. The share of cost is based on the following calculation: $1,350 (countable monthly income) less $600 (MNA) = $750 (share of cost). California Health Care Foundation, Share of Cost Medi-Cal (September 2010), p. 7.